In my last post, I shared how I was heading to Japan for a few weeks to take advantage of my freelance lifestyle. I described my feelings of excitement, anticipation, and slight nervousness. Now that I’m coming to the end of part 1 of my “working holiday,” I thought I’d share how it’s been going so far. 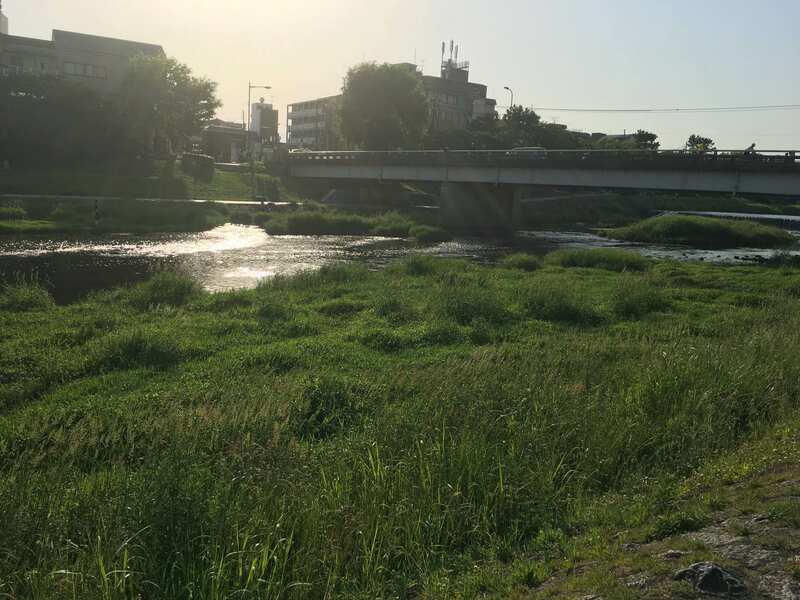 I’m currently sitting in the Starbucks on Sanjodori in Kyoto, overlooking the Kamo river. This is one of the activities that I had eagerly anticipated, and I can say that expectation pretty well matches reality in this case. It’s a rainy day, so I can see the drops splashing against the outdoor deck and the usual parade of people outside is thinner and wearing more protective outerwear than usual. One thing I didn’t anticipate when I imagined working from a café in Kyoto was the students. There are so many of them! This is not a complaint; merely an observation. If you visit a Starbucks in the late afternoon, I’d say a good 40–60% of the patrons are junior high and high school students. Yesterday at the table next me, two girls sat in their school uniforms, English textbooks in hand, diligently working on their homework. That is, until one of them put her head down on the table and proceeded to nap for a good 20 minutes. Her companion looked pretty unfazed. She just continued working quietly and chatted with her friend whenever she’d wake from her nap. 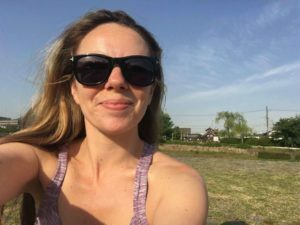 I think the big lesson for me in this experience (the working from Japan thing; not the students napping in Starbucks thing, although there’s probably a lesson in there, too!) is that it takes time to uproot yourself from your normal life and establish a routine in a completely different country and timezone. On previous visits to Japan, I hadn’t really noticed so much of a problem with jet lag, but part of that was probably due to the fact that I didn’t need to be useful for anything—I could stay up late, wake up at random times, and still go about my day of sightseeing and meeting up with friends. But on this trip, because I needed to actually produce work, I found it much more of a struggle initially. My lesson here is that on any future visits I should allow myself a little extra time to adjust and not have too many strict deadlines for the first few days after I arrive. Overall, I was pretty happy with the routine I settled on—wake up super early (thank you, jet lag), work for a few hours, take a break to go out and do some sightseeing or some other activity, come home and work for a few more hours, then grab lunch somewhere and/or go on an afternoon excursion. In Kyoto, there are so many temples, gardens, and shrines, and I was also staying close to Tetsugaku no michi (The Path of Philosophy), which is a lovely little path along a canal that’s dotted with shops, cafés, and temples, and made for the perfect afternoon break. So when planning a future trip of this sort, I’d also consider my proximity to sightseeing/activity spots to be able to take similar breaks. One of my biggest questions for myself was whether I would feel lonely—my entire trip is 3 weeks long and while I will be meeting up with friends and family along the way, I’m staying by myself the whole time. So far, there have been a few moments when I’ve felt lonely, but for the most part I’ve managed to keep myself pretty entertained. I think staying by myself is especially important given the fact that I need a quiet space where I can work and that would be difficult to find if I stayed at someone else’s place. So overall, I think this approach makes the most sense for this type of trip. Finally, I think weekends and time off are super important! My weekend here in Kyoto was awesome because I was able to do some of the activities that were further afield and would have been trickier to fit into a morning or afternoon break. At the same time, I packed every free moment over the weekend full of activities, so by the time Sunday evening rolled around, I was exhausted. I was really happy that on Monday I’d be working so I wouldn’t feel as much pressure to be constantly running around. So for me, the verdict is clear: Working from anywhere is definitely possible, and it’s something I look forward to perfecting and pursuing more in the future!